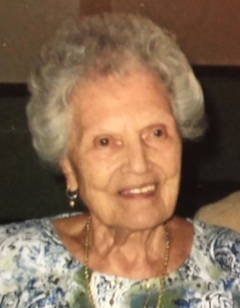 Helen A. Montigelli, 95, of Black River, passed away Thursday, January 4th, 2018. Arrangements are with the Bruce Funeral Home. There will be no calling hours. A Funeral Mass will be held at Holy Family Church at the family's convenience. A private burial will follow in Black River Cemetery. Helen was born on January 29, 1922 in Carthage, NY. She married Dominic Montigelli on July 12, 1942 in NYC. The couple moved to Carthage where she was a homemaker. She later worked in food service at Carthage High School and Carthage Area Hospital. She was appreciated and respected for her diligent work and thoughtful care. Helen and Dominic settled in Black River in 1973 where her husband and son owned and operated Montigelli Builders. Dominic passed away August 21, 2003. Helen was a communicant of Holy Family Church and enjoyed spending time with her family. Among her survivors are a son and daughter in law, Michael and Kathie Montigelli, Black River, two daughters and their husbands, Loretta and Raymond, TX and Ellen and Ron, TX, four grandchildren, Lori , Debra , Raymond, and Nicolas, two great grandchildren, Sarah and Jack, two sisters, Sadie and Josephine, several nieces and nephews. She is predeceased by her parents and four brothers, James, John, Albert and Frank. The family would like to express heartfelt appreciation for the wonderful home health care that Helen received from the caring and professional staff at Jefferson County Public Health.